Temima Crafts make wooden boxes which are beautiful and tactile on the outside and useful and fun on the inside. A Box is a box is a box! There’s so much more to a ‘Bloomin’ Clever Box’ than meets the eye. Check out the short ‘Bandsaw Box in One Minute’, video on this page to see what we mean. Explore our site and be introduced to the full range of 'Bloomin' Clever Boxes'. Beautiful, tactile, useful and fun. 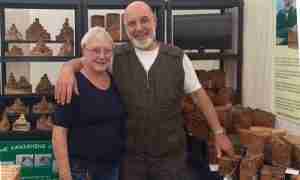 Ray and Kathy sell their work at quality craft shows up and down the country. Alternatively get in touch for details on how to make a purchase. See our venues page for more details. View the pricelist. of our most popular designs here. An unprepossessing bit of wood is, with a flick of the wrist, transformed into a fairy-tale castle. We attend various craft shows around the UK.